It’s hell being a celebrity, especially if you’re young and find yourself at a party, where marijuana and cameras should never mix. And it’s not exactly heaven being sheriff of a county with escalating drug crimes and pressure to treat all offenders equally. Thus it is that Olympian swimmer Michael Phelps and Sheriff Leon Lott of South Carolina’s Richland County are being forced to treat seriously a crime that shouldn’t be one. 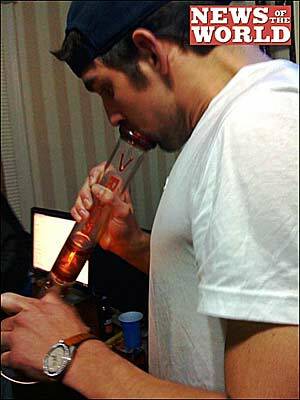 As everyone knows by now, Phelps was photographed smoking from an Olympic-sized bong during a University of South Carolina party last November. As all fallen heroes must — by writ of the Pitchforks & Contrition Act — Phelps has apologized for behavior that was “regrettable and demonstrated bad judgment,” and has promised never to be a lesser role model again. Lott, meanwhile, is threatening action against Phelps because … he has to. Widely respected and admired as a “good guy” who came up through the ranks, Lott is in a jam. Not one to sweat the small stuff, he nevertheless has said that he’ll charge Phelps with a crime if he determines that the 14-time gold-medal winner did, in fact, smoke pot in his county. The sheriff’s job will be made both easier and tougher by evidence that includes a photograph of Phelps with his face buried in a smoke-filled tube and what Lott has called a “partial confession.” Phelps has said that the photo is legit. The only missing link, apparently, is the exact location of the party. What’s tough is that Lott probably doesn’t want to press charges because it’s a waste of time and resources. He’s got much bigger fish to fry, but several recent drug-related crimes — including at least two high-profile murders — have captured community attention. And the law is the law. Therein lies the problem. Our marijuana laws have been ludicrous for as long as we’ve been alive. Almost half of us (42 percent) have tried marijuana at least once, according to a report published last year in PLoS Medicine, a journal of the Public Library of Science. The U.S., in fact, boasts the highest percentage of pot smokers among 17 nations surveyed, including The Netherlands, where cannabis clouds waft from coffeehouse windows. Among them are no small number of high-ranking South Carolina leaders (we knew us when), who surely cringe every time a young person gets fingered for a “crime” they themselves have committed. Other better-known former tokers include our current president and a couple of previous ones, as well as a Supreme Court justice, to name just a few. A complete list would require the slaughter of several mature forests. This we know: Were Phelps to run for public office someday and admit to having smoked pot in his youth, he would be forgiven. Yet, in the present, we impose monstrous expectations on our heroes. Several hand-wringing commentaries have surfaced the past few days, lamenting the tragic loss for disappointed moms, dads and, yes, The Children. Understandably, parents worry that their kids will emulate their idol, but the problem isn’t Phelps, who is, in fact, an adult. The problem is our laws — and our lies. Obviously, children shouldn’t smoke anything, legal or otherwise. Nor should they drink alcoholic beverages, even though their parents might. There are good reasons for substance restrictions for children that need not apply to adults.That’s the real drug message that should inform our children and our laws, rather than the nonsense that currently passes for drug information. Today’s anti-drug campaigns are slightly wonkier than yesterday’s “Reefer Madness,” but equally likely to become party hits rather than drug deterrents. One recent ad produced by the White House Office of National Drug Control Policy says: “Hey, not trying to be your mom, but there aren’t many jobs out there for potheads.” Whoa, dude, except maybe, like, president of the United States. Once a kid realizes that pot doesn’t make him insane — or likely to become a burrito taster, as the ad further asserts — he might figure other drug information is equally false. That’s how marijuana becomes a gateway drug. Phelps may be an involuntary hero to this charge, but his name and face bring necessary attention to a farce in which nearly half the nation are actors. It’s time to recognize that all drugs are not equal — and change the laws accordingly. this kind of incident…which should have been a non-incident…just goes to show ya how much power has been placed in the hands of morons. Wow. The author really hit the nail on the head here. Would there have been such an outrage if Phelps was photographed doing tequila shots at a party??? Would the photo have even made it on the BACK page? I doubt it. He had already been arrested for DUI years ago and that didn’t seem to bother anyone even though DUI’s kill innocent people every day in this country. Then again, Phelps wasn’t really a household name at that time. Oh well…this country has such severe ADHD this will all be forgotten by next week when Katie Couric gets caught doing blow with Regis Philban in the NBC break room. This is exactly the kind of thing that Prop. 5 would have ended….stupid and ridiculous waste of taxpayer money and investigators time. Check out http://www.drugpolicy.org to learn more about the growing lobby against the War on Drugs. This article makes sense. Thank you. mr fresh, jon, YippieRedone and nunya – thanks for your comments. I nominate each of you for drug czar. jon – I’ve been reading your comments of late, and they’re always great, thanks for joining the commenters’ club here. nunya – good to hear from you. We’ve missed your on-the-spot comments,and we feel honored that a fellow blogger would take the time to make ‘appearances’ here. thanks. YippieReborn – thanks for your input and the link. Please keep it up. Assuming you know what the yippies were all about. Some day ask me about the Yippie invasion of La Jolla, circa Spring 1970. What the story failed to mention is after smoking up (and doing who knows what else) he then got behind the wheel of a car. In my mind, that’s where he used poor judgment. I don’t believe smoking pot is any worse than drinking, and I think it’s actually better. But driving under the influence of any substance is not cool. I think it’s very wrong the the media is focusing on the pot rather than the DUI. Only one of those things should be a crime, and here is a hint, it’s not smoking pot! Whoever took and leaked the photo must feel like a total wang. So, I hear Kellogs has dropped him from endorsements. Anyone else up for a boycott of Rice Krispies?? Wait…Frosted Flakes. Rice Krispy treats are just too good. Especially if you’re stoned. lol. jon – you’re not a sugar junkie, are ya? There may soon be incriminating pictures on the internets of me stuffing my face with Rice Krispy treats after calling for a boycott! 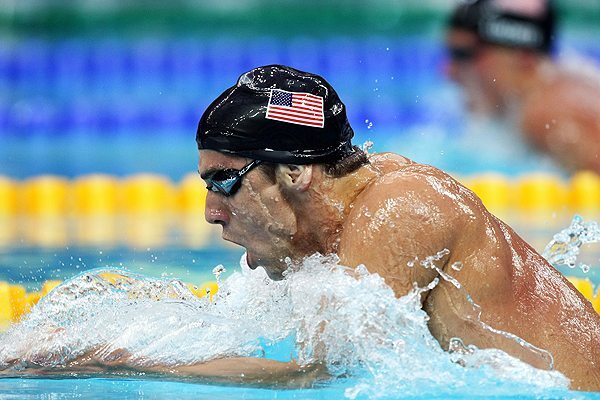 Once again the Amerrikans have confused “celebrity” with “hero.” Phelps is not a “hero.” He is now a celebrity because of his athletic prowess. He has become famous because he trained as a swimmer for years & outperformed other athletes during competition. His feats, spectacular as they are, do not make him by definition of the word a hero. Typically, a hero would need to place himself in bodily harm to save the life of another person. Unless he was saving the life of some other person at that party by hitting the bong, he is not a hero; he is merely a celebrity. Celebrities come and go, live ‘n die. Look at Jack LaLane. He’s been a celebrity since the 1950’s, and he’s still going! How long can Phelps train? Can he maintain a high degree of health? Or will he end up like Johnnie Weismiller checking ID’s at some club? Maybe busting Phelps for smoking pot will do the country good by starting a backlash against the arcane drug laws imposed on Amerrikans by the fascist U.S. gummint. If you do visit, please take note of the number of unsolved homicides listed on the page and the few missing person reports. But those are so difficult to solve when you can easily spend your time arresting college kids for smokin’ a little pot at a party. I guess I’m just glad I don’t live in South Carolina. Richland County Sheriff Leon Lott announces at a press conference today that Michael Phelps nor anyone else will be charged with a crime at the party where the infamous photo of Michael Phelps apparently smoking a bong was taken. Several people will be charged based on the drugs that were found when their houses were searched to investigate the incidents surrounding the photo. National Drug Policy reform groups including the Drug Policy Alliance, Marijuana Policy Project, Students for Sensible Drug Policy and SAFER have organized campaigns to publicize the issue. Sheriff Lott, crawl back into your drug warrior cave and focus on real crimes.